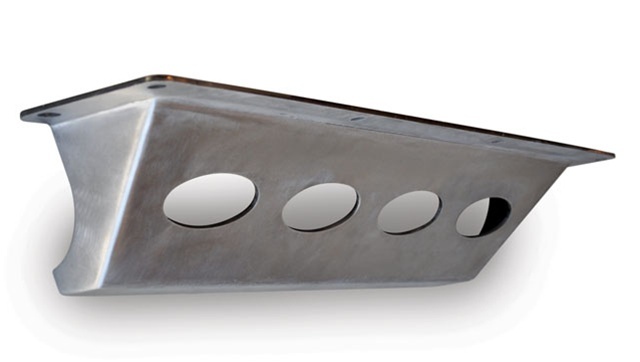 The JK BFH Disco Skid is an optional bolt-on skid plate to protect the factory electric swaybar disconnect motor on JK's. In stock form this motor hangs low, making it vulnerable to rocks and trail hazards. The BFH Disco Skid protects it, but also comes with hardware and instructions to rotate the motor upward, further out of harm's way. Like the BFH bumper, the Disco Skid is made of CNC laser-cut 3/16" plate steel and is designed to be a great looking, functional addition to the JK BFH bumper. This product ships as bare steel—it will need to be painted or powder coated prior to final installation. We do not offer a powder coat option for this item. IMPORTANT: The BFH Disco Skid was designed to work with the '07-'11 JK Rubicon sway bar disconnect mechanism. It is NOT designed to work with the 2012 and newer units. Customers may use this product on their 2012 and newer JK Rubicon at their own discretion, but Poison Spyder makes no warranty as to fitment or guarantee against damage to other components of the Jeep due to the use of this product on 2012 and newer JK Rubicons. If you own a 2012 and newer JK Rubicon and are considering installing this product on it, here is a brief explanation of the compatibility issue. Installing the BFH Disco Skid requires a procedure to rotate the electric sway bar disconnect mechanism so that it tucks up higher underneath the Jeep and clears the skid, which is designed for maximum ground clearance. Beginning with the 2012 model year, Jeep changed to a different design for the electric sway bar disconnect mechanism on the JK Rubicon. On these 2012 and newer Rubiocns, the sway bar mechanism rotation procedure may leave a small part of the mechanism housing in slight contact with the bottom edge of the air conditioning condenser unit. It may also slightly contact the skid itself. This can result in damage to the condenser. Those who still want to install the Disco Skid on their 2012 and newer Rubicon may do so at their own risk, though they may minimize that risk by grinding away material from the mechanism housing where it would rub the condenser. Poison Spyder provides no instructions for doing this, however, and makes no warranty for the product or damage caused by installing it on 2012 and newer JK Rubicons. NOTE: The JK BFH Disco Skid works only in conjunction with the JK BFH Front Bumper. It is not designed to work with the stock or other aftermarket bumpers. The disco skid plate is another well made piece, great design. The skid plate flowes really well with the BFH bumper and looks really cool. Drilling the holes to line up with the bumber and the skid plate was a small challenge but accomplish. Rotating the electronic swaybar disconnect was another easy step, no issues there. This was a great quality product. The only problem I had was that the holes to secure the skid did not line up with my 2013 2dr rubicon. I had to drill the holes to make this fit. I wasn't very happy with this but I has already painted it and poison spyder put a form in the packaging stating that they would not accept any painted items. It looks good but I expect stuff to fit.